Robotic surgery are types of surgical procedures that are done using robotic systems. Robotically-assisted surgery was developed to try to overcome the limitations of pre-existing minimally-invasive surgical procedures and to enhance the capabilities of surgeons performing open surgery. In the case of robotically-assisted minimally-invasive surgery, instead of directly moving the instruments, the surgeon uses one of two methods to control the instruments; either a direct telemanipulator or through computer control. A telemanipulator is a remote manipulator that allows the surgeon to perform the normal movements associated with the surgery whilst the robotic arms carry out those movements using end-effectors and manipulators to perform the actual surgery on the patient. 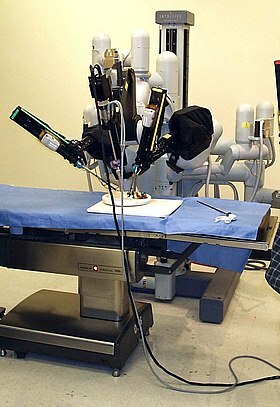 In computer-controlled systems, the surgeon uses a computer to control the robotic arms and its end-effectors, though these systems can also still use telemanipulators for their input. One advantage of using the computerized method is that the surgeon does not have to be present, but can be anywhere in the world, leading to the possibility for remote surgery. A robotic arm is a type of mechanical arm, usually programmable, with similar functions to a human arm; the arm may be the sum total of the mechanism or may be part of a more complex robot. The links of such a manipulator are connected by joints allowing either rotational motion or translational (linear) displacement. The links of the manipulator can be considered to form a kinematic chain. The terminus of the kinematic chain of the manipulator is called the end effector and it is analogous to the human hand. In robotics, an end effector is the device at the end of a robotic arm, designed to interact with the environment. The exact nature of this device depends on the application of the robot. In the case of enhanced open surgery, autonomous instruments (in familiar configurations) replace traditional steel tools, performing certain actions (such as rib spreading) with much smoother, feedback-controlled motions that could be achieved by a human hand. The main object of such smart instruments is to reduce or eliminate the tissue trauma traditionally associated with open surgery without requiring more than a few minutes' training on the part of surgeons. This approach seeks to improve open surgeries, particularly cardio-thoracic, that have so far not benefited from minimally-invasive techniques. Remote surgery is the ability for a doctor to perform surgery on a patient even though they are not physically in the same location. It is a form of telepresence. A robot surgical system generally consists of one or more arms, a master controller (console), and a sensory system giving feedback to the user. Remote surgery combines elements of robotics, cutting edge communication technology such as high-speed data connections and elements of management information systems. While the field of robotic surgery is fairly well established, most of these robots are controlled by surgeons at the location of the surgery. Remote surgery is essentially advanced telecommuting for surgeons, where the physical distance between the surgeon and the patient is less relevant. It promises to allow the expertise of specialized surgeons to be available to patients worldwide, without the need for patients to travel beyond their local hospital. Coronary artery bypass – rerouting of blood supply by bypassing blocked arteries that provide blood to the heart. General surgeons focus on any abdominal contents. With regards to robotic surgery, this type of procedure is currently best suited for single-quadrant procedures, in which the operations can be performed on any one of the four quadrants of the abdomen. Robotic surgery in the field of urology has become very popular, especially in the United States. It has been most extensively applied for excision of prostate cancer because of difficult anatomical access. It is also utilized for kidney cancer surgeries and to lesser-extent surgeries of the bladder. In 1985 a robot, the Unimation Puma 200, was used to orient a needle for a brain biopsy while under CT guidance during a neurological procedure. In the late 1980s, Imperial College in London developed PROBOT, which was then used to perform prostatic surgery. The advantages to this robot was its small size, accuracy and lack of fatigue for the surgeon. In 1992, the ROBODOC was introduced and revolutionized orthopedic surgery by being able to assist with hip replacement surgeries. The latter was the first surgical robot that was approved by the FDA in 2008. The ROBODOC from Integrated Surgical Systems (working closely with IBM) could mill out precise fittings in the femur for hip replacement. The purpose of the ROBODOC was to replace the previous method of carving out a femur for an implant, the use of a mallet and broach/rasp. Urology, also known as genitourinary surgery, is the branch of medicine that focuses on surgical and medical diseases of the male and female urinary-tract system and the male reproductive organs. Organs under the domain of urology include the kidneys, adrenal glands, ureters, urinary bladder, urethra, and the male reproductive organs. The Lindbergh operation was a complete tele-surgical operation carried out by a team of French surgeons located in New York on a patient in Strasbourg, France using telecommunications solutions based on high-speed services and sophisticated Zeus surgical robot. The operation was performed successfully on September 7, 2001 by Professor Jacques Marescaux and his team from the IRCAD. This was the first time in medical history that a technical solution proved capable of reducing the time delay inherent to long distance transmissions sufficiently to make this type of procedure possible. The name was derived from the American aviator Charles Lindbergh, because he was the first person to fly solo across the Atlantic Ocean. Prostatectomy as a medical term refers to the surgical removal of all or part of the prostate gland. This operation is done for benign conditions that cause urinary retention, as well as for prostate cancer and for other cancers of the pelvis. Intuitive Surgical Inc. is an American corporation that develops, manufactures and markets robotic products designed to improve clinical outcomes of patients through minimally invasive surgery, most notably with the da Vinci Surgical System. The company is part of the NASDAQ-100 and S&P 500. As of September 30, 2017, there was an installed base of 4,271 units worldwide – 2,770 in the United States, 719 in Europe, 561 in Asia, and 221 in the rest of the world. Laparoscopic radical prostatectomy (LRP) is a form of radical prostatectomy, an operation for prostate cancer. Contrasted with the original open form of the surgery, it does not make a large incision but instead uses fiber optics and miniaturization. Computer-assisted surgery (CAS) represents a surgical concept and set of methods, that use computer technology for surgical planning, and for guiding or performing surgical interventions. CAS is also known as computer-aided surgery, computer-assisted intervention, image-guided surgery and surgical navigation, but these are terms that are more or less synonymous with CAS. CAS has been a leading factor in the development of robotic surgery. The Vattikuti Urology Institute (VUI) at the Henry Ford Hospital in Detroit, Michigan is a clinical and research center for urological care. The VUI is notable for being the first institute to establish robotic surgery as a treatment for patients with prostate cancer. To date, the VUI has performed more than 5,000 robotic procedures. The institute currently has 110 regular staff members, 19 full-time senior staff members, 14 clinical staff members and 5 full-time Ph.D scientists. Ranked consistently high by U.S. News and World Report, VUI is also one of the largest and most active urology departments in the United States, with nearly 50,000 patients annually from all 50 states and nearly 25 countries. David B. Samadi is a celebrity doctor and is the former Chairman of Urology and Chief of Robotic Surgery at Lenox Hill Hospital. He is a board-certified urologist trained in the diagnosis and treatment of urologic diseases, prostate cancer, kidney cancer and bladder cancer, and specializes in advanced minimally invasive treatments for prostate cancer, including laparoscopic radical prostatectomy and laparoscopic robotic radical prostatectomy. Mani Menon, born 9 July 1948 in Trichur, India, is an American surgeon whose pioneering work has helped to lay the foundation for modern robotic cancer surgery. He is the founding director and the Raj and Padma Vattikuti Distinguished Chair of the Vattikuti Urology Institute at the Henry Ford Hospital in Detroit, MI, where he established the first cancer-oriented robotics program in the world. Menon is widely regarded for his role in the development of robotic surgery techniques for the treatment of patients with prostate, kidney, and bladder cancers, as well as for the development of robotic kidney transplantation. Menon is the recipient of the Gold Cystoscope award, Hugh Hampton Young award, the Keyes Medal, the prestigious B.C. Roy award. He has been inducted into the Johns Hopkins Society of Scholars, the highest honor awarded by the University. The Society of Urologic Robotic Surgery instituted a Gold Medal in Menon's name in 2017, of which he was the first recipient. An exhibit titled Many Voices, One Nation at the Smithsonian National Museum of American History incorporates some of Menon's person effects. Ashutosh K. Tewari is the Chairman of Urology at the Icahn School of Medicine at Mount Sinai Hospital in New York City. He is a board certified American urologist, oncologist, and principal investigator. Before moving to the Icahn School of Medicine in 2013, he was the founding director of both the Center for Prostate Cancer at Weill Cornell Medical College and the LeFrak Center for Robotic Surgery at NewYork–Presbyterian Hospital. Dr. Tewari was the Ronald P. Lynch endowed Chair of Urologic Oncology and the hospital's Director of Robotic Prostatectomy, treating patients with prostate, urinary bladder and other urological cancers. He is a world leading urological surgeon, and has performed over 9,000 robotically assisted procedures using the da Vinci Surgical System. Academically, he is recognized as a world-renowned expert on urologic oncology with over 250 peer reviewed published papers to his credit; he is on such lists as America's Top Doctors, New York Magazine's Best Doctors, and Who's Who in the World. In 2012, he was given the American Urological Association Gold Cystoscope Award for "outstanding contributions to the field of urologic oncology, most notably the treatment of prostate cancer and the development of novel techniques to improve the outcomes of robotic prostatectomy." Sharp Memorial Hospital is a hospital in San Diego, California, in the United States. Opened in 1955, Sharp Memorial is Sharp HealthCare's largest hospital and the system's only designated Level II trauma center. Located in Serra Mesa, the hospital has 334 private patient rooms, including 48 for intensive-care services. McLaren Flint is a nonprofit, 378 bed tertiary teaching hospital located in Flint, Michigan. McLaren is affiliated with the Michigan State University College of Human Medicine's medical residency programs, including family medicine, internal medicine, general surgery, orthopedic surgery and radiology. McLaren also maintains a hematology/oncology fellowship program in partnership with Michigan State University and is sponsoring a surgical oncology fellowship program. McLaren Flint is a subsidiary of McLaren Health Care Corporation. The ZEUS Robotic Surgical System (ZRSS) was a medical robot designed to assist in surgery, originally produced by the American robotics company Computer Motion. Its predecessor, AESOP, was cleared by the Food and Drug Administration in 1994 to assist surgeons in minimally invasive surgery. The ZRSS itself was cleared by the FDA seven years later, in 2001. ZEUS had three robotic arms, which were remotely controlled by the surgeon. The first arm, AESOP, was a voice-activated endoscope, allowing the surgeon to see inside the patient’s body. The other two robotic arms mimicked the surgeon’s movements to make precise incisions and extractions. ZEUS was discontinued in 2003, following the merger of Computer Motion with its rival Intuitive Surgical; the merged company instead developed the Da Vinci Surgical System. Hudson Regional Hospital (HRH) is an acute care hospital, located on the Hackensack River, in Secaucus, New Jersey, in the middle of the New Jersey Turnpike and busy Route 3 traffic flow. HRH has a helipad for transporting injured persons from the scene of an accident to the hospital and/or for transferring patients in critical need of specialized services from HRH to another hospital having that capability. Sanjay Razdan is a board certified American urologist, oncologist, and principal investigator, specialized in the treatment of prostate cancer and urological diseases. He is an urological robotic surgeon and has performed over 6,500 robotically assisted procedures using the Da Vinci Surgical System. ↑ "Robot-Assisted Laparoscopic Procedures - Robotic Surgery - Surgery - Cancer Treatment Services - Cancer Center - Willis-Knighton Health System - Shreveport - Bossier City - Ark-La-Tex". www.wkhs.com. Retrieved 2019-04-14. 1 2 3 Barbash GI, Glied SA (August 2010). "New technology and health care costs--the case of robot-assisted surgery". The New England Journal of Medicine. 363 (8): 701–4. doi:10.1056/nejmp1006602. PMID 20818872. ↑ Health, Center for Devices and Radiological. "Safety Communications - Caution When Using Robotically-Assisted Surgical Devices in Women's Health including Mastectomy and Other Cancer-Related Surgeries: FDA Safety Communication". www.fda.gov. Retrieved 6 March 2019. 1 2 Estey EP (December 2009). "Robotic prostatectomy: The new standard of care or a marketing success?". Canadian Urological Association Journal = Journal de l'Association des Urologues du Canada. 3 (6): 488–90. doi:10.5489/cuaj.1182. PMC 2792423 . PMID 20019980. ↑ O'toole MD, Bouazza-Marouf K, Kerr D, Gooroochurn M, Vloeberghs M (2009). "A methodology for design and appraisal of surgical robotic systems". Robotica. 28 (2): 297–310. doi:10.1017/S0263574709990658. 1 2 3 4 Kolata G (13 February 2010). "Results Unproven, Robotic Surgery Wins Converts". The New York Times . 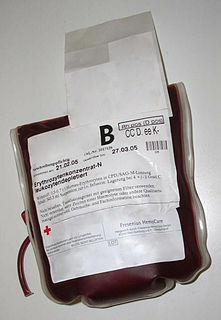 Retrieved 11 March 2010. 1 2 3 Finkelstein J, Eckersberger E, Sadri H, Taneja SS, Lepor H, Djavan B (2010). "Open Versus Laparoscopic Versus Robot-Assisted Laparoscopic Prostatectomy: The European and US Experience". Reviews in Urology. 12 (1): 35–43. PMC 2859140 . PMID 20428292. ↑ Gerhardus D (July–August 2003). "Robot-assisted surgery: the future is here". Journal of Healthcare Management / American College of Healthcare Executives. 48 (4): 242–51. doi:10.1097/00115514-200307000-00008. PMID 12908224. ↑ Kavoussi LR, Moore RG, Adams JB, Partin AW (December 1995). "Comparison of robotic versus human laparoscopic camera control". The Journal of Urology. 154 (6): 2134–6. doi:10.1016/S0022-5347(01)66715-6. PMID 7500476. 1 2 3 Herron DM, Marohn M (February 2008). "A consensus document on robotic surgery". Surgical Endoscopy. 22 (2): 313–25, discussion 311–2. doi:10.1007/s00464-007-9727-5. PMID 18163170. ↑ "Robotic Surgery: Risks vs. Rewards". AORN Journal. 106 (2): 186–157. August 2017. doi:10.1016/j.aorn.2017.05.007. PMID 28755672. ↑ Mirkin JN, Lowrance WT, Feifer AH, Mulhall JP, Eastham JE, Elkin EB (April 2012). "Direct-to-consumer Internet promotion of robotic prostatectomy exhibits varying quality of information". Health Affairs. 31 (4): 760–9. doi:10.1377/hlthaff.2011.0329. PMC 3897330 . PMID 22492893. ↑ Basto M, Cooperberg MR, Murphy DG (February 2015). "Proton therapy websites: information anarchy creates confusion". BJU International. 115 (2): 183–5. doi:10.1111/bju.12667. PMID 25756133. ↑ Kypson AP, Chitwood Jr WR (2004). "Robotic Applications in Cardiac Surgery". International Journal of Advanced Robotic Systems. 1 (2): 87–92. arXiv: cs/0412055 . Bibcode:2004cs.......12055K. ↑ Mayer H, Gomez F, Wierstra D, Nagy I, Knoll A, Schmidhuber J (2008-01-01). "A System for Robotic Heart Surgery that Learns to Tie Knots Using Recurrent Neural Networks". Advanced Robotics. 22 (13–14): 1521–1537. doi:10.1163/156855308X360604. ↑ Melfi FM, Menconi GF, Mariani AM, et al. Early experience with robotic technology for thoracoscopic surgery. Eur J Cardiothorac Surg 2002;21:864-8. ↑ Hyun MH, Lee CH, Kim HJ, Tong Y, Park SS (November 2013). "Systematic review and meta-analysis of robotic surgery compared with conventional laparoscopic and open resections for gastric carcinoma". The British Journal of Surgery. 100 (12): 1566–78. doi:10.1002/bjs.9242. PMID 24264778. ↑ Talamini MA, Chapman S, Horgan S, Melvin WS (October 2003). "A prospective analysis of 211 robotic-assisted surgical procedures". Surgical Endoscopy. 17 (10): 1521–4. doi:10.1007/s00464-002-8853-3. PMID 12915974. ↑ Melvin WS, Needleman BJ, Krause KR, Schneider C, Ellison EC (2002). "Computer-enhanced vs. standard laparoscopic antireflux surgery". Journal of Gastrointestinal Surgery. 6 (1): 11–5, discussion 15–6. doi:10.1016/S1091-255X(01)00032-4. PMID 11986012. ↑ Melvin WS, Dundon JM, Talamini M, Horgan S (October 2005). "Computer-enhanced robotic telesurgery minimizes esophageal perforation during Heller myotomy". Surgery. 138 (4): 553–8, discussion 558–9. doi:10.1016/j.surg.2005.07.025. PMID 16269282. ↑ Shaligram A, Unnirevi J, Simorov A, Kothari VM, Oleynikov D (April 2012). "How does the robot affect outcomes? A retrospective review of open, laparoscopic, and robotic Heller myotomy for achalasia". Surgical Endoscopy. 26 (4): 1047–50. doi:10.1007/s00464-011-1994-5. PMID 22038167. ↑ Zhou JY, Xin C, Mou YP, Xu XW, Zhang MZ, Zhou YC, Lu C, Chen RG (2016). "Robotic versus Laparoscopic Distal Pancreatectomy: A Meta-Analysis of Short-Term Outcomes". PLOS ONE. 11 (3): e0151189. Bibcode:2016PLoSO..1151189Z. doi:10.1371/journal.pone.0151189. PMC 4790929 . PMID 26974961. ↑ Liu H, Lawrie TA, Lu D, Song H, Wang L, Shi G (December 2014). "Robot-assisted surgery in gynaecology". The Cochrane Database of Systematic Reviews. 12 (12): CD011422. doi:10.1002/14651858.CD011422. PMID 25493418. ↑ "Committee opinion no. 628: robotic surgery in gynecology". Obstetrics and Gynecology. 125 (3): 760–7. March 2015. doi:10.1097/01.AOG.0000461761.47981.07. PMID 25730256. ↑ Zanagnolo V, Garbi A, Achilarre MT, Minig L (16 January 2017). "Robot-assisted Surgery in Gynecologic Cancers". Journal of Minimally Invasive Gynecology. 24 (3): 379–396. doi:10.1016/j.jmig.2017.01.006. PMID 28104497. ↑ DiGioia AM, Jaramaz B, Picard F, Nolte L, eds. (30 December 2004). Computer and robotic assisted hip and knee surgery. Oxford University Press. pp. 127–156. ISBN 978-0-19-850943-1. 1 2 Shweikeh F, Amadio JP, Arnell M, Barnard ZR, Kim TT, Johnson JP, Drazin D (March 2014). "Robotics and the spine: a review of current and ongoing applications". Neurosurgical Focus. 36 (3): E10. doi:10.3171/2014.1.focus13526. PMID 24580002. ↑ Tzvetanov I, Bejarano-Pineda L, Giulianotti PC, Jeon H, Garcia-Roca R, Bianco F, Oberholzer J, Benedetti E (December 2013). "State of the art of robotic surgery in organ transplantation". World Journal of Surgery. 37 (12): 2791–9. doi:10.1007/s00268-013-2244-x. PMID 24101021. ↑ Lee DI (April 2009). "Robotic prostatectomy: what we have learned and where we are going". Yonsei Medical Journal. 50 (2): 177–81. doi:10.3349/ymj.2009.50.2.177. PMC 2678689 . PMID 19430547. ↑ Williams SB, Prado K, Hu JC (November 2014). "Economics of robotic surgery: does it make sense and for whom?". The Urologic Clinics of North America. 41 (4): 591–6. doi:10.1016/j.ucl.2014.07.013. PMID 25306170. ↑ Ramsay C, Pickard R, Robertson C, Close A, Vale L, Armstrong N, Barocas DA, Eden CG, Fraser C, Gurung T, Jenkinson D, Jia X, Lam TB, Mowatt G, Neal DE, Robinson MC, Royle J, Rushton SP, Sharma P, Shirley MD, Soomro N (2012). "Systematic review and economic modelling of the relative clinical benefit and cost-effectiveness of laparoscopic surgery and robotic surgery for removal of the prostate in men with localised prostate cancer". Health Technology Assessment. 16 (41): 1–313. doi:10.3310/hta16410. PMC 4780976 . PMID 23127367. ↑ "Medical Post 23:1985" (PDF). ↑ Kwoh YS, Hou J, Jonckheere EA, Hayati S (February 1988). "A robot with improved absolute positioning accuracy for CT guided stereotactic brain surgery". IEEE Transactions on Bio-Medical Engineering. 35 (2): 153–60. doi:10.1109/10.1354. PMID 3280462. ↑ Paul HA, Bargar WL, Mittlestadt B, Musits B, Taylor RH, Kazanzides P, Zuhars J, Williamson B, Hanson W (December 1992). "Development of a surgical robot for cementless total hip arthroplasty". Clinical Orthopaedics and Related Research. &NA, (285): 57–66. doi:10.1097/00003086-199212000-00010. PMID 1446455. ↑ Lanfranco AR, Castellanos AE, Desai JP, Meyers WC (January 2004). "Robotic surgery: a current perspective". Annals of Surgery. 239 (1): 14–21. doi:10.1097/01.sla.0000103020.19595.7d. PMC 1356187 . PMID 14685095. ↑ "ROBODOC: Surgical Robot Success Story" (PDF). Retrieved 25 June 2013. ↑ Meadows M. "Computer-Assisted Surgery: An Update". FDA Consumer magazine. Food and Drug Administration. Archived from the original on 1 March 2009. ↑ McConnell PI, Schneeberger EW, Michler RE (2003). "History and development of robotic cardiac surgery". Problems in General Surgery. 20 (2): 20–30. doi:10.1097/01.sgs.0000081182.03671.6e. ↑ Unger SW, Unger HM, Bass RT (1994-09-01). "AESOP robotic arm". Surgical Endoscopy. 8 (9): 1131. doi:10.1007/BF00705739. PMID 7992194. ↑ Baek SJ, Kim SH (May 2014). "Robotics in general surgery: an evidence-based review". Asian Journal of Endoscopic Surgery. 7 (2): 117–23. doi:10.1111/ases.12087. PMID 24877247. ↑ Leslie Versweyveld (29 September 1999). "ZEUS robot system reverses sterilization to enable birth of baby boy". Virtual Medical Worlds Monthly. ↑ "Robotics: the Future of Minimally Invasive Heart Surgery". Biomed.brown.edu. 6 October 1999. Retrieved 29 November 2011. ↑ "Linbergh Operation – IRCAD/EITS Laparoscopic Center" . Retrieved 19 January 2011. ↑ Boyd WD, Rayman R, Desai ND, Menkis AH, Dobkowski W, Ganapathy S, Kiaii B, Jablonsky G, McKenzie FN, Novick RJ (October 2000). "Closed-chest coronary artery bypass grafting on the beating heart with the use of a computer-enhanced surgical robotic system". The Journal of Thoracic and Cardiovascular Surgery. 120 (4): 807–9. doi:10.1067/mtc.2000.109541. PMID 11003767. ↑ Boyd WD, Kiaii B, Kodera K, Rayman R, Abu-Khudair W, Fazel S, Dobkowski WB, Ganapathy S, Jablonsky G, Novick RJ (February 2002). "Early experience with robotically assisted internal thoracic artery harvest". Surgical Laparoscopy, Endoscopy & Percutaneous Techniques. 12 (1): 52–7. doi:10.1097/00019509-200202000-00009. PMID 12008763. ↑ "Telerobotic Surgery". SRI International . Retrieved 30 September 2013. ↑ Satava RM (February 2002). "Surgical robotics: the early chronicles: a personal historical perspective". Surgical Laparoscopy, Endoscopy & Percutaneous Techniques. 12 (1): 6–16. doi:10.1097/00129689-200202000-00002. PMID 12008765. ↑ Sung GT, Gill IS (December 2001). "Robotic laparoscopic surgery: a comparison of the DA Vinci and Zeus systems". Urology. 58 (6): 893–8. doi:10.1016/s0090-4295(01)01423-6. PMID 11744453. ↑ "New Robot Technology Eases Kidney Transplants". CBS News. 22 June 2009. Retrieved 8 July 2009. ↑ "da Vinci Si Surgical System". Intuitive Surgical . Retrieved 30 September 2013. ↑ Oliveira CM, Nguyen HT, Ferraz AR, Watters K, Rosman B, Rahbar R (2012). "Robotic surgery in otolaryngology and head and neck surgery: a review". Minimally Invasive Surgery. 2012: 286563. doi:10.1155/2012/286563. PMC 3337488 . PMID 22567225. 1 2 Weinstein GS, O'malley BW, Hockstein NG (July 2005). "Transoral robotic surgery: supraglottic laryngectomy in a canine model". The Laryngoscope. 115 (7): 1315–9. doi:10.1097/01.MLG.0000170848.76045.47. PMID 15995528. ↑ Lee SY, Park YM, Byeon HK, Choi EC, Kim SH (August 2014). "Comparison of oncologic and functional outcomes after transoral robotic lateral oropharyngectomy versus conventional surgery for T1 to T3 tonsillar cancer". Head & Neck. 36 (8): 1138–45. doi:10.1002/hed.23424. PMID 23836492. ↑ "Autonomous Robotic Surgeon performs surgery on first live human". Engadget. 19 May 2006. ↑ "Robot surgeon carries out 9-hour operation by itself". Phys.Org. ↑ Parekattil S. "Robotic Infertility" . Retrieved 11 October 2012. ↑ "Surgeons perform world's first pediatric robotic bladder reconstruction". Esciencenews.com. 20 November 2008. Retrieved 29 November 2011. ↑ "neuroArm : revolutionary procedure a world first". ucalgary.ca. 16 May 2008. Retrieved 14 November 2012. ↑ Hagn U, Nickl M, Jörg S, Tobergte A, Kübler B, Passig G, et al. (2008). "DLR MiroSurge – towards versatility in surgical robotics". Jahrestagung der Deutschen Gesellschaft für Computer und Roboterassistierte Chirurgie; Proceedings of CURAC. 7: 143–146. ↑ "Beter opereren met nieuwe Nederlandse operatierobot Sofie" (in Dutch). TU/e. 27 September 2010. Archived from the original on 24 July 2011. Retrieved 10 October 2010. ↑ "V UKC Ljubljana prvič na svetu uporabili žilnega robota za posege na femoralnem žilju" [The First Use of a Vascular Robot for Procedures on Femoral Vasculature] (in Slovenian). 8 November 2010. Retrieved 1 April 2011. ↑ "UKC Ljubljana kljub finančnim omejitvam uspešen v razvoju medicine" [UMC Ljubljana Successfully Develops Medicine Despite Financial Limitations] (in Slovenian). 30 March 2011. Wikimedia Commons has media related to Surgical robots .